The Waving Flag: Fame At Last! I checked the visitor statistics today to see if the post on Islamic Persians had been popular. 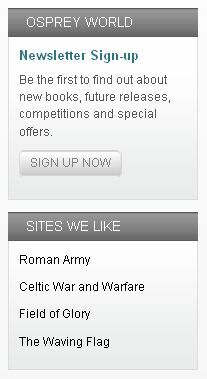 It has indeed been very popular but imagine my surprise when I noticed that the Ancient World section of the brand new Osprey web site is featuring The Waving Flag as one of their “Sites We Like”. I have to admit to being a touch flattered but more importantly I think it is a sign I’m doing something of interest. As far as Osprey is concerned the least I can do is return the favour. So, if you haven’t already, please visit the new Osprey web site. Thanks for pointing out the new Opsrey website. We like to stick up useful sites so if you know of any more please let us know.